This option is good when you have a lot of candidates or nominations. The drop down menus are searchable so a user can start typing a name to quickly get to the student they want. 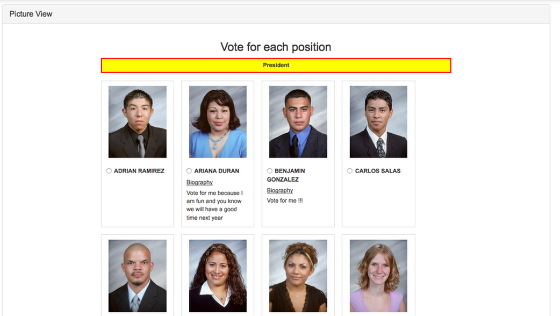 When your students are allowed to choose more then one candidate the select multiple option is what you will use. The system will keep track of how many candidates they have selected and will not let them select any more once they get down to 0 for each candidate. This view works well when you want the voters to see all candidates or options at one time. We dont recommend this view when you are doing nominations or have a list of 30 or more per position because the page gets very long. 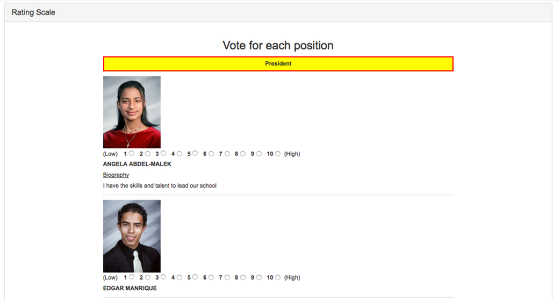 This option is designed when you want to get a ranking for each candidate or option. This works well for surveys asking questions like how safe do you feel on campus and they can rate from 1-10.